1) What is the translation of of Sigma Delta Pi’s Greek motto “Spanías Didagéi Proágomen”? 2) How much is the membership fee? $25 per initiate; this price includes membership for life (no annual dues at the national level), a membership pin and certificate. Orders should be made by the respective faculty adviser using the official order forms (click here). 3) May I include extra payment with my order for overnight delivery? Yes. Regardless of the number of pins and certificates ordered, there is a flat fee of $35 for expedited processing and overnight USPS delivery service. 4) Is there a cheaper way for expedited delivery service? Yes. Priority Mail (approx. 3 days for delivery) is our standard mailing service for all orders. Simply pay the indicated shipping, and your order will be sent via Priority Mail. 5) Can candidates for membership order their pins and certificates individually and directly from the national headquarters? Because the chapter adviser is responsible for ensuring that each candidate meets the national qualifications for membership, all orders must originate from the chapter adviser. Also and whenever possible, each order should consolidate all qualifying candidates and the method of payment (one check, one money order, or one American Express, Discover, Visa, or MasterCard number for the entire order). 6) When preparing the certificates for our ceremony, one or more of them was accidentally ruined. Can I purchase replacement certificates? Yes. Send the ruined certificate(s) plus $3 for each one to be replaced (plus $10 shipping and handling for Priority Mail service) to the Executive Director. You can use the standard order form by writing in the item and price. 7) One (or more) of the pins you sent us is defective. Can you replace it? Yes. Send us the defective pin(s), and we will replace it/them immediately. 8) Can we order extra pins and certificates for students that might show last-minute interest for membership? We ask that you only order the number of pins and certificates for the confirmed number of initiates planning to participate in your ceremony. 9) We sent you our order over three weeks ago, and we still haven’t received our materials. We were even careful to send you the order as instructed: “at least two weeks prior to the initiation ceremony.” What happened? Generally, all orders are processed the same day received or the very next day. All materials are also sent via Priority Mail of the US Postal Service. However, on rare occasions and despite best efforts of chapters and National Headquarters, Priority Mail service inexplicably lags. If seven days have passed since you sent your order and you have still not received your materials, please contact the Executive Director, Mark P. Del Mastro, to determine either if your order was received or when your materials were sent. 10) When ordering materials, I inadvertently overpaid. Can you reimburse me the difference? Instead of a reimbursement, you will receive a credit to your account that you may use for future orders. 11) Can we hold more than one induction ceremony during the academic year? Does the ceremony have to be in the spring term? Many chapters hold two initiation ceremonies yearly, and a few schedule as many as three. There is no limit to the number of induction ceremonies a chapter may hold each year, and such ceremonies can be held ANY time (fall, spring or summer). 12) One or more candidates did not show up for the ceremony. Now we have extra pins and certificates. Can we return them for a refund? Please retain the extra pins and certificates for future ceremonies. 13) We are preparing to apply for a chapter at our institution. Is there an appropriate time during the academic year when we should begin the application process? When should we submit the petition to the Executive Director? An institution may begin the charter application process and submit the petition anytime. 14) We are ready to send you our charter application. Where should I send the $75 charter fee? To whom should I write out the check? Your payment should be included with your petition and supporting documentation and sent directly to the Executive Director. All checks should be written out to Sigma Delta Pi. The charter fee may also be paid with American Express, Discover, MasterCard or Visa. 15) I am the proposed faculty adviser for a chapter petitioning reactivation or for an institution petitioning a charter, and I am not currently a member of Sigma Delta Pi. Am I to pay for my one-time membership fee? No. The membership fee is waived for faculty advisers submitting chapter reactivation or charter petitions. 16) May I send you the order form and accompanying payment with our charter petition or chapter reactivation application? Please refrain from sending your order form for pins and certificates until your charter petition or chapter reactivation application has been officially approved. 17) We have already sent you the $75 charter fee and application. However, we have since changed the anticipated installation date. Is this a problem? Once we receive your complete charter application, and the Executive Council has subsequently approved your petition, we immediately begin preparing your charter. Therefore, any change in the originally scheduled installation date will require the printing of a new charter to reflect the correct date; you will also be charged an additional $75. We therefore ask chapters to confirm their projected installation date BEFORE sending their petition to National Headquarters (address of the Executive Director) in order to avoid the extra fee. 18) I am already a member of Sigma Delta Pi, but I seem to have misplaced my pin. Can I purchase a replacement? Yes. Please forward to us your complete name, the year and chapter of your initiation, and $10 for a replacement pin. Be sure to include $10 for postage and handling. 19) Can you please print the names of our initiates and other pertinent information on the certificates for us? The preparation of the certificates is the responsibility of the individual chapter. 20) I would prefer obtaining a copy of the Ritual in the hard copy, booklet form. How can I do this? Additional ritual booklets are $3. Fill out our standard order form and place a request for a new ritual booklet in the additional instructions or questions box at the end of the form. 21) I am a chapter adviser or a chapter officer and would like a hard copy of the Chapter Adviser Handbook. How can I obtain one? Simply request a copy by e-mailing the Executive Director. 22) One (or more) of the candidates did not show up for the initiation ceremony. Can I still give them their pins and certificates as if they were present? As stated in Section 7, Article III of the national by-laws, no candidate may be initiated either by proxy or in absentia. Those that miss the ceremony can only become members if initiated in a future ceremony. Frequently, chapter advisors opt to initiate such candidates later in a more low profile ceremony using the short form of the Ritual. If this is not possible, candidates must wait until the next planned ceremony (either the following semester or next academic year). 23) A few candidates arrived after the ceremony had already begun. We simply allowed them to assume their corresponding positions in the ceremony. Was this acceptable? As stated in Section 7, Article III of the national by-laws, candidates can only be initiated if they arrive in time for the beginning of the ceremony. Candidates arriving late cannot be admitted either to observe or participate in the event. 24) When and how should we send the national office our list of new members? 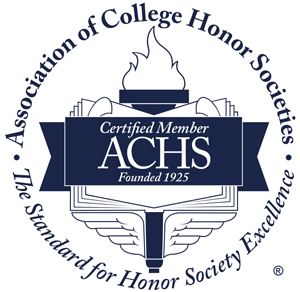 Please include the list of your newly-inducted chapter members on the annual report that your chapter should submit AFTER your initiation ceremonies and at the conclusion of your academic term. 25) Our chapter is presently constructing its own website. Can we use the background and/or logo found on the National webpage? Yes. Any active chapter of the Society may use the graphics found on the National website for their own webpage. We only ask that you be sure to link the National site to your chapter’s. Also, please forward your chapter’s web address to the Executive Director once established. 26) Our chapter does not presently have officers (President, Vice President, Secretary-Treasurer). Are these really necessary? If so, how should we begin, and how long should chapter officers serve? History demonstrates that chapter officers help to ensure a thriving organization. As expressed in Section 9, Article III of the National By-laws, “only active members shall vote or hold office in a chapter.” Therefore, active members should nominate and vote for at least three chapter officers: President, Vice President and Secretary-Treasurer. Each should serve no longer than a term spanning one full academic year. A few weeks prior to the end of each academic year, the current President should call a meeting to nominate and elect new officers for the next year. The officers-elect would then begin their respective posts at the beginning of the new academic year. It is critical, however, that officers be on campus during their entire term(s) to perform their duties. Consequently, student members who plan to study abroad during the academic year should not be elected as officers during the coinciding term. 27) May we induct an Alumnus Member of Sigma Delta Pi into our chapter as an Honorary Member? Honorary Membership is for those who are not already members of Sigma Delta Pi and who meet the criteria for Honorary Membership as outlined in the national by-laws. 28) Where can we purchase official Sigma Delta Pi apparel and related items? Please visit the website of Kalamazoo Regalia, the only official, authorized seller of Sigma Delta Pi merchandise.